Freezing temperatures? Cold feet and hands? The CLIMSOM mattress topper allows you to warm the place where you sleep: the surface of your mattress. You can lower the temperature or turn off the heater at night altogether for unprecedented comfort and substantial savings. Do you often have cold feet and hands at bedtime? Does it also bother your sleeping partner? You could warm your bed with CLIMSOM in order to get warm quickly under the covers. 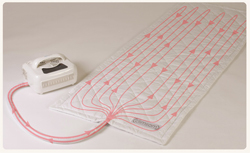 The CLIMSOM mattress pad will warm your bed in a few minutes. Once your feet and hands are warm, you could return to a cooler and more constant temperature. It will activate the blood circulation through vasoconstriction. CLIMSOM can reach a cool temperature from a much warmer one in a few minutes. The ideal temperature of your bed is personal. Your best guide will be your happiness and comfort. By directly warming your bed, you can lower or even switch off your heater. As CLIMSOM features low energy consumption, you will benefit from substantial savings that will quickly pay off your purchase. Furthermore, you can appreciate sleeping with the windows of your bedroom open while staying nice and warm in your bed.